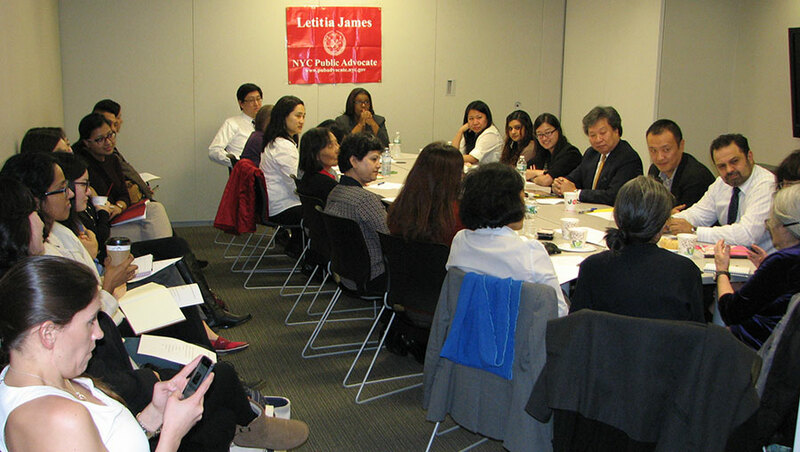 On Wednesday, December 17, 2014, the Federation welcomed Public Advocate Letitia James to a roundtable discussion with its member agencies about pressing issues the Asian American community has been facing. As community agencies voiced their concerns about various government programs, services, and departments, Ms. James carefully addressed each matter, taking the time to ask questions in order to better understand the needs of the Asian communities and Asian human service organizations in New York City. Some areas of concern that were discussed included: language access to and cultural competency of government agencies, senior housing issues, immigration-related problems such as municipal ID fraud and the need to educate the Asian community on such fraud matters, and the lack of Asian social service contracts, including problems arising as a subcontractor. This last issue has been particularly challenging for Asian organizations. Linda Lee, executive director of Korean Community Services of Metropolitan New York (KCS), shared her frustration that, as a subcontractor, KCS cannot market its meals-on-wheels program, nor can it enroll new clients in need of homebound meals, despite receiving direct requests on a daily basis. Its only option is to add people to a long waiting list instead of getting them the immediate help they need. To help shed light on this issue, the Federation plans to release a report in early 2015 on the current number of API social service contracts being appointed in NYC. The Federation graciously thanks the Public Advocate for her time and this opportunity for an open dialogue with service providers in NYC's Asian American communities.